Dell Quay is the home club for some 80 cruisers ranging from 19 to 49 feet. Many, all bilge or lifting keelers, are on swinging moorings at Dell Quay, but we also have boats ranging the Harbour from Chichester Marina and Birdham Pool, to swinging moorings at Westlands and Bosham. We are a friendly Club, and at the heart of our activities is helping each other to get the most out of our sailing, by sharing technical and navigation experiences, cruising in company in the harbour, rallying in the Solent, crossing the Channel and by running a series of winter social events. Winter social, training events and visits. Moorings – we have 19 for hire to members. Winter lay up for boats up to 26 feet. Two pulling dinghies to access yachts moored at Dell Quay. Free loan of a pressure washer, moisture meter, polisher and oil extractor. And of course, we participate in the full social programme of the Club and make use of the bar and patio with its beautiful views. Why not browse and register to attend some of the Cruiser Rallies? Dell Quay Sailing Club provides a number of cruiser moorings and berths for tenders. These, apart from the visitor’s mooring, are available for use, by club members only, for a rent on an annual basis. Fees applicable to all moorings and tender berths are set annually by the Cruiser Sub-committee on the basis of general membership fee changes agreed by the Club’s annual general meeting. Mooring fees additionally take account of the cost of mooring licence and rental charges levied by the Chichester Harbour Conservancy and other bodies, and of the cost of moorings maintenance. Mooring and berthing costs for the year can be viewed on the DQSC website or under the Membership menu. The club moorings are categorised in accordance with the classes of moorings published by the Chichester Harbour Master .The club has moorings of classes C2, C3, D3 and D4. Moorings are located to the South and North West of the quay. Tender berthing is at the shore end of the South Quay for hard hulled tenders, and in racks inside the Black Shed for inflatable tenders. The club procures the services of an external contractor to inspect and maintain those moorings for which it holds a licence from the Chichester Harbour Conservancy. The club will similarly ensure that any mooring rented from an external agency, private individual or business, is either inspected and maintained by that agency, or will procure the service of an external contractor for that purpose. All moorings rented by the club will therefore have been inspected, maintained as necessary, and be in safe condition for use by suitable boats (in accordance with the guidelines for moorings set out by the Chichester Harbour Conservancy) at the beginning of each sailing season. Moorings users must be aware that the club does not undertake further inspection of moorings. 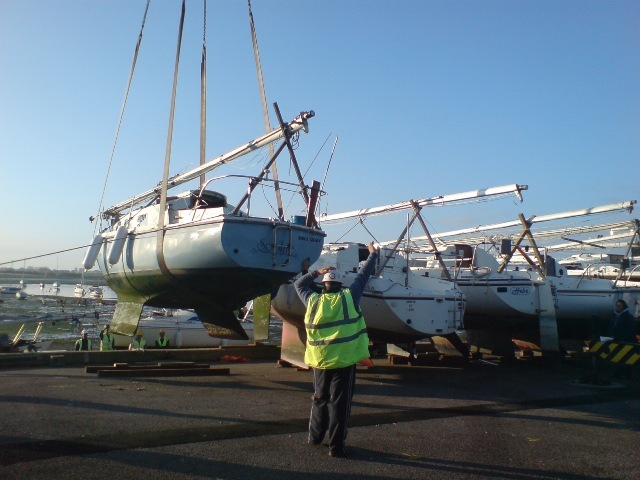 It is entirely the responsibility of the mooring user to ensure the suitability of the mooring and notify the club of any damage to or deterioration of the mooring during the period of use (Club lift in to lift out dates as arranged annually). Existing users wishing to change mooring. Members with applications held on the waiting list, in order of and date of application, earliest first. Mooring users shall ensure that the mooring is suitable for the boat they moor on it. The boat so moored shall be within the limits published by the Chichester Harbour Master for the particular class of mooring. Mooring users shall ensure that the boat moored is fully insured and shall fully indemnify the club against all risk arising from the use of the mooring. Mooring users shall exercise due care and seamanship in the use of the mooring. Mooring users shall pay due regard to the condition of the visible parts of their allocated mooring and must promptly make good if practical, and / or report to the Moorings Officer any serious damage or deterioration. A member renting a mooring, but ceasing to require it at any time during the sailing season, shall remain responsible for the rental of the mooring and condition thereof for the remainder of the rental season. (The club will not offer a refund of fees for the remaining period of the rental.) The member may however sublet the mooring to another club member for the remainder of the season, provided always that all terms conditions and responsibilities are maintained. Such subletting must be reported in writing to the Moorings Officer giving the name of the member taking on the mooring, together with the name, class, and length of the boat to be moored. The member taking on the mooring will be classed as the Existing User for allocation purposes in subsequent years. The club maintains one mooring for use by visiting yachts. The mooring is a large yellow C3 mooring numbered DP89 with a pick up buoy. It is situated just to the South of Dell Quay, adjacent the channel, and on firm ground. It is the closest mooring to the Quay. It is a half tide mooring providing access for 21/2 to 3 hours either side of high tide. The club maintains 22 berths which are let on an annual basis for storage of inflatable tenders associated with members’ boats using moorings local to Dell Quay. The berths are for boats to be stored vertically within a timber framework. Additionally one berth is reserved for use by the sailing committee for storage of equipment used for training purposes, and one berth is reserved for the storage of fender boards, a-frames and similar equipment used for raising and lowering of cruiser masts. A compartment has been provided for the storage of small outboard engines associated with tenders or locally moored cruisers. There is limited storage for steps, ladders, etc against the rear (west) wall of the shed. Black Shed users should note that the centre of the shed is utilised for the storage of cruiser masts over winter, and consequently access to tender berths is restricted during the winter season. The east end of the shed is separately maintained by the Sailing Committee and is used for storage of dinghy masts, foils, power boats and racing equipment. The central area of the shed, between the vertical tender racks, is to be kept clear. It is not available for storage. Similarly, the space within the roof structure is not available for storage. Black Shed berths are let on an annual basis. All berths are numbered (77 to 101, 85 being for A-frame storage). Berths are to the left of the berth number. Existing users wishing to change berth. Members with applications held on a waiting list, in order of and date of application, earliest first. The stored boat and /or engine must be owned by a club member and be associated with that member’s boat which is usually moored in the Dell Quay area. Any equipment stored in the Black Shed is stored at the owner’s entire risk. Berth holders shall pay due regard to other users and avoid any action or omission of action likely to cause inconvenience to other members. All tenders and engines shall be insured for 3rd party liability (tender and engine insurance cover included within a cruiser’s insurance policy is considered adequate) and the club indemnified against any claim arising. The shed berths are for the storage of inflatable tenders only. “Tender” means only the boat and its seat, floor (kept in the tender), air pump, engine mount and oars. For avoidance of doubt, no other equipment, goods, chandlery, spars, sails, etc. is to be kept within the shed. Anything other than approved equipment may be removed. All tenders must be kept within their allocated berths. Tenders must be kept inflated such that they can be readily moved and are self supporting. Tenders must be clearly identifiable with appropriate identification attached to the tender and visible from the floor of the shed. Current Club berthing stickers attached to the tender are appropriate identification. Engines of 6HP and under may (currently and subject to review), if there is room, be kept in the engine storage area, properly hung on the bearers provided. All engines must be clearly marked or labelled to identify their owner. Engines with integral fuel tanks should be stored with the fuel tank full. This is to reduce risk of explosion in the event of fire. Apart from integral fuel tanks, no other fuel or fuel tank may be stored in the Black Shed under any circumstances. Shed users should note that the Sailing Committee has its own special arrangements for the storage of fuel for its purposes. Berth holders who abuse the allocation of a berth will be asked to promptly remedy the situation. Persistent abuse or violation of the above conditions may result in the rental of the berth being revoked. Any inappropriately stored items may be removed at any time and without notice. Rigid tender storage is available within a marked area at the East end of the South side of the Quay for approximately 8 boats. Individual berths are not marked out. Berthing in this area is available for rent annually for the period of the sailing season, club cruiser lift-in to lift-out. During the winter season the area is required for cruiser lay-up and tenders must be removed. Tenders are dinghies up to 3 meter in length and licensed by the Harbour Master as “tenders” (see CHM Harbour Dues information). Members wishing to store dinghies over 3 meters should apply to the Berthing Secretary for a North Quay berth.